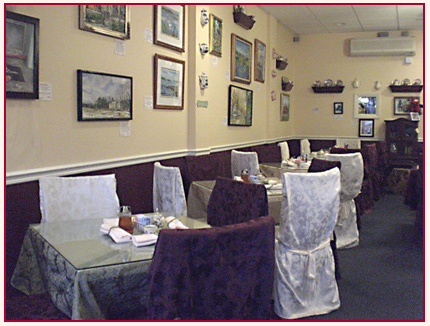 Our quaint tea room is the perfect setting for a cup or pot of your favorite tea or perhaps to discover a new one! We offer several tea brands and blends as well as fruit and herbal tisanes. Art prints and teacups adorn the soft peach walls and fresh flowers or candles grace each table creating a warm, inviting atmosphere. Our unique porcelain and china teacups and teapots are often the topic of conversation. We offer an extensive menu featuring our popular "Afternoon Tea"(reservations required), a traditional, three-course affair. We invite you to browse our menu below. Our Sandwiches and Scones, are available for your special occasion or to enjoy at home! * There is a Sharing Fee of $10 Per Afternoon Tea Service. English Breakfast ~ This China Black takes milk and sugar well. The perfect way to begin a hectic day! Strawberry/Kiwi ~ Slightly tart and very refreshing. Perfect hot or iced! At The Tea Leaf, we practice safe food handling. However, only you know the severity of your or a loved one's allergy. We respectfully ask that you refrain from ordering any of our offerings if you have any hesitation or question about a potentially hazardous ingredient. Since some of our menu offerings may not be made on our premises, they contain or may contain peanuts/peanut butter, tree nuts, soy, dairy, wheat and eggs. Some or all of these ingredients are on the premises. We can't in good conscience take liberties when advising on such an important issue. Thanks for ordering responsibly!